Product prices and availability are accurate as of 2019-04-18 00:58:02 UTC and are subject to change. Any price and availability information displayed on http://www.amazon.com/ at the time of purchase will apply to the purchase of this product. Celebrate a classic look with a new trend thats making its way into town: the Penzance Living Room Sofa Collection. 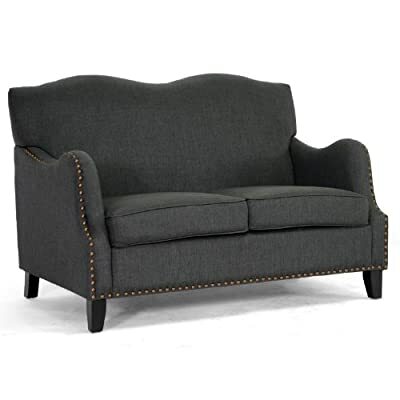 This dark charcoal gray linen modern loveseat features stylish curves on the backrest and arms. It is made with a birch frame, black legs, non-marking feet, and foam cushioning. The finishing touch? Bronze nail head trim runs along portions of the contemporary loveseats perimeter. This Chinese-built design also features removable seat cushions and requires minor assembly. To keep the linen in tip-top shape, spot clean only. A matching sofa is also available (sold separately). Loveseat dimensions: Seat: 19 inches high x 44 inches wide x 23 inches deep Overall: 37.25 inches high x 52.5 inches wide x 33 inches deep Arm height: 26 inches.